Several spring-fun doings are hopping by the attraction through Easter Saturday. You can hold court with a certain superstar rabbit if you hop to the Orange-based attraction through Saturday, April 20. How does the Easter Bunny prefer to arrive at a place where he knows his fans are waiting? He can hop there, of course, and that's no surprise, as the large rabbit is pretty famous for the spring in his step. He can always get a ride, from a friend, perhaps another holiday superstar, like Cupid or Santa Claus. But if a train is nearby, you just know that the large-of-ear icon is going to want to ride the rails, for few conveyances convey spring-sweet charm like a choo-choo going chugga-chugga down the tracks. And such a conveyance is currently strong in the chugga-chugga-ing department, in Orange, all to celebrate the days leading up to Easter. 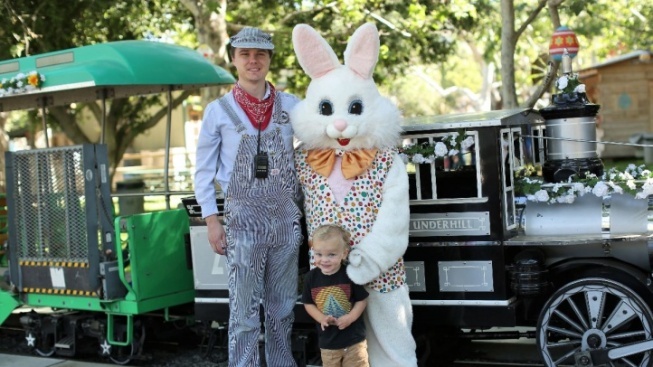 It's Irvine Park Railroad that we're mooning over, of course, and the Easter Bunny is appearing there, each day, right through to Saturday, April 20. Again, that's the day before Easter, and not on Easter itself, so be sure to hop, hop, hop over to the activity-packed attraction by Easter Eve. And speaking of activities, they're sweet 'n plentiful. There's an Easter egg hunt, at select times each day, and a moon bounce, and an egg basket toss, and cookie decorating, plus lots more. The prices to join the activities? One activity ticket is $6, though do note that some of the activities will require more than one ticket, like the Easter egg hunt. And meeting the Easter Bunny is twelve dollars. Getting in, however? Totally free, while parking is additional. Are the tots savoring spring break? Are you looking for something sweet and old-fashioned to do, and a chance to see a handsome hare while there? The Irvine Park Railroad's annual Easter Extravaganza is an Orange County classic. Ride the rails, or hop like a rabbit, to this page, to find out more now.